Summary: The TI graphing calculator community started in 1990 with the release of the first graphing calculator by Texas Instruments (the TI-81), and continues today with the current series of graphing calculators. The TI community of today is very much different from the TI community of the past, however, as it has undergone a transformation over time in terms of the makeup of its members, the sites and programming groups, the programs being released, and the interest in the graphing calculators. Although other companies produce similar or even superior calculators, most notably Hewlett Packard (HP), Casio, and Sharp, Texas Instruments is the most widely recognized calculator company and its calculators are the most widely used and supported. One of the primary reasons is because Texas Instruments has established a close partnership with the educational community, making their calculators an integral component of the classroom experience for students. 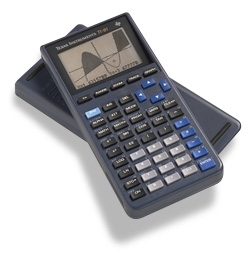 Texas Instruments heavily markets their calculators as the standard classroom calculator, and consequently math and science textbooks almost exclusively reference their calculators in interactive problems. They also actively train teachers through their support of the T3 program on how to successfully use and integrate their calculators into the classroom. This has resulted in TI having a virtual monopoly on the educational scene, with most schools and teachers requiring that students purchase TI calculators. TI also provides a whole assortment of resources to support educators, including classroom activities and supplemental materials, such as sample lesson plans, workbooks, and newsletters. Many of these materials are written by fellow educators, and thus provide proven suggestions for teaching math and science concepts. Also offered are Internet discussion groups and mailing lists, allowing educators to communicate and collaborate with one another. They also involve educators in the design and production of their calculators. When Texas Instruments started developing a graphing calculator in late 1986, for example, they organized and attended conferences, workshops, and discussion groups with teachers and the larger educational community. They also worked with the National Council of Teachers of Mathematics (NCTM), the leading mathematics education development body in the US, and integrated the standards that the NCTM published in 1989 for using technology in the classroom. By incorporating educators into the design and development process, Texas Instruments is able to create better, more useful calculators that provide the specific features and functionality that teachers want and need. For example, the TI-83 was an improvement over the earlier released TI-82, including new statistical and financial functions and enhanced graphing capabilities. This collaboration allows educators much power and freedom, and makes the TI calculators that much easier to use and integrate into the classroom. Since the inception of the TI graphing calculator, almost all of the focus and attention has exclusively been on schools and teachers. In fact, the graphing calculator is really just the latest progression in the relationship, as Texas Instruments has been developing portable handheld calculators collaboratively with educators for several years prior to the release of the TI-81 graphing calculator in 1990. Texas Instruments is a long-time leader in innovation in technology, including being the first company to produce the silicon transistor and integrated circuit that power almost all modern electronics, as well as releasing the first four-function handheld calculator in 1967, jointly releasing the first portable calculator dubbed the Pocketronic with Canon in 1970, and releasing the first commercially portable calculator the TI-2500 Datamath in 1972. 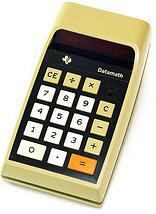 Since then, however, other companies have been the first to release new advances to the portable calculator. HP released the first scientific calculator with transcendental functions in 1972, the HP-35, and Texas Instruments released their own calculator in 1973. Similarly, Casio released the first calculator with built-in graphing software in late 1985 (the fx-7000G), and HP and Sharp soon followed with their graphing calculator the HP-28C in 1986 and EL-5200 in 1987, respectively. Being a late entry to the graphing calculator market proved to be an advantage for Texas Instruments, as they were able to learn from the mistakes and successes made by the other graphing calculators. For example, HP's calculators used Reverse Polish Notation (RPN) for entering expressions, which was difficult to understand as that is not how expressions are written down on paper. At the same time, they provided a primitive computer algebra system (CAS) for symbolic manipulation, which was a very popular feature with educators. Texas Instruments also kept the core functionality and design of their graphing calculator similar to the Casio fx-7000G to make the learning curve as easy as possible for students and teachers in the classroom. For example, their graphing calculator uses the same screen dimensions, text display, interactive graphing and analysis, the last executed command is also saved in an input buffer, its syntax closely parallels the same standard algebraic syntax, and it provides much of the same built-in programming capabilities. The simple four-function and more complex scientific calculator were instrumental in starting the relationship with the educational community, as both proved to be invaluable tools in the classroom due to their relatively inexpensive cost, portable handheld size, and computer-like functionality, and eventually gained widespread support and adoption. Their use in the classroom was controversial, however, and they were not readily received by the educational community when they first debuted. Many within the educational community were even more antagonistic to graphing calculators, and viewed them as an attempt to disrupt the traditional teaching methods that had always been used. In truth, graphing calculators did have a major impact on education and represented a fundamental change in the teaching and learning of mathematics, removing the need for students to spend inordinate time mastering paper-and-pencil computation and instead focusing on developing deeper conceptual understanding. There are also many topics in mathematics that students struggle with, such as geometry, trigonometry, and calculus, and graphing calculators provide a more effective visual representation that allows interactive experimentation and investigation. Students can also readily do calculations because entire expressions are visible on the screen at one time, as well as more easily seeing the relationship between algebraic equations and their associated graphs, and subsequently students have delved deeper into mathematics than ever before. Professors Bert Waits and Franklin Demana of the mathematics department at Ohio State University led the early use of handheld calculators in the classroom in the mid 70s and then graphing calculators in the mid 80s, including writing and teaching precalculus materials to local high school students in Ohio — resulting in the publication of their textbook Precalculus Mathematics: A Graphing Approach — with graphing calculators a core component and emphasis of their learning approach and curriculum. They then started a related Computers and Calculators in Precalculus (C2PC) project at Ohio State University in Summer 1988, which was designed to provide professional development for educators from around the country via week-long workshops with instruction on how to use and integrate graphing calculators into the classroom. The C2PC program continued to expand in both size and scope, including the creation of sister institutes and a yearly national conference, and was renamed Teachers Teaching with Technology (T3) in 1992. Texas Instruments eventually became its primary supporter and financial backer, and even had the program moved in 1994 to the University of Texas at Arlington in Arlington, Texas and then finally Dallas, Texas in 1996 so that it could be headquartered closer to them. They also started the Demana-Waits Scholarship for Future Teachers for students who plan to pursue a teaching career in mathematics in recognition of their service to the educational community. Although Bert Waits and Franklin Demana retired in 2005, the T3 program still continues today. In fact, the program has grown even larger, with support for the international educational community (including a popular international conference held each spring), personalized workshops, and full online integration. Since its inception, the program has served more than 50,000 teachers, with hundreds of thousands of students benefiting in the classroom. Besides the T3 program, Bert Waits was also responsible for creating the Graph-TI mailing list and newsgroup in April 1992 for allowing online communication and collaboration between educators. An accompanying file archive was later added in April 1994, allowing people to share and download files that they or others had made. The file archive housed a wide array of programs, software, documents, and data for the TI graphing calculators. Texas Instruments actively supported Graph-TI and eventually assumed control over it. Texas Instruments also actively supported the newsletters created by members of the educational community centered around their graphing calculators. When the TI-81 debuted, for example, some of the educators that were using the calculator decided to put together a newsletter for fellow educators containing ideas about using the calculator in the classroom, sample programs to use and explore, and general news about teaching. The TI-81 Graphing Calculator Newsletter was released in Fall 1991 by Nils Ahbel, Terry Walsh, Linda Antinone, and John Mahoney, and was later renamed Eightysomething! in 1992 by Dave Slomer when he became an editor with the release of the TI-85; the list of active editors would change over time, along with the scope expanding to cover the new TI graphing calculators. The newsletter was the leading periodical about graphing calculators, with a circulation of over 70,000 at its peak. The two other popular newsletters focused on using calculators in the classroom were It's About T.I.M.E. and TI-Cares. It's About T.I.M.E. (Technology In Math Education) provided teachers of mathematics in grades K-8 with a forum where they can share ideas on the appropriate use of calculator technology in the classroom, including proven classroom activities, tips on calculator use, and classroom management techniques. TI-Cares contained information for teacher development, including product news, support programs, reference material, and a calendar of professional development opportunities. All three newsletters were published by Texas Instruments two or three times per year (Fall, Spring, and sometimes Summer), and available to educators for download on Texas Instruments' website or by subscription for free. Although TI-Basic is viewed by many in the TI community as something that is a waste of time, as the language is rather limited in its capabilities and lots of poor programmers use it to create equally poor programs, TI-Basic is really the main impetus for the start of the TI community. Because TI-Basic is readily accessible due to it being built-in to the TI graphing calculators and using straightforward syntax and commands, it allows almost anybody with a TI graphing calculator to write their own programs. The TI-Basic language has evolved along with each of the TI graphing calculators, and each calculator has its own variant, with a uniquely specific combination of syntax, commands and functions, and features and functionality. The original version of TI-Basic on the TI-81 is actually quite limited, with just basic commands and functions supported; for example, there are no looping commands provided, and instead a combination of conditionals and branching is needed to make loops. The TI-81 itself was also quite limited, including little memory (2,400 bytes), a slow processor (4 MHz), and no linkport. The lack of linkport, in particular, proved to be very detrimental to the success and adoption of the calculator, as it prevented people from sharing and downloading programs. You could not just transfer programs via a graph link, but instead needed to manually type the code into the calculator. Consequently, there was little community support for it and limited programs released. TI's next graphing calculator after the TI-81 was the much more powerful TI-85 released in July 1992. The TI-85 included significantly more memory, a faster processor, a multi-level menu system, and several new features and functionality. The TI-Basic language also received an upgrade, as there were several new commands and functions introduced as well as a new tokenization approach to program execution and editing. 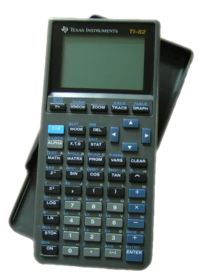 The TI-85 was deemed too powerful and too difficult to use by educators, however, and TI released an upgrade from the TI-81 called the TI-82 in July 1993. The TI-82 was specifically targeted to the typical high school student, and the calculator's TI-Basic language was a compromise between the simpler TI-81 and the more complex TI-85, featuring the TI-81's syntax and most of the TI-85's commands without the complicated tokenization. The TI-82 was heavily marketed by Texas Instruments in collaboration with educators, and consequently became especially popular and gained widespread support and adoption from the community. Texas Instruments would continue to support the TI-82 line of graphing calculators going forward into the future, as they released the upgraded TI-83/84 calculators that were intentionally designed to be similar to allow for backwards compatibility and ease of use. While the Graph-TI mailing list was exclusively focused on educational topics, Texas Instruments noticed that students were increasingly interested in using their graphing calculators beyond education. Subsequently, they created a separate mailing list and newsgroup called Calc-TI in April 1994 to support the programming- related and more technical discussions, which allowed the sharing of TI-Basic code and programs as well as the posting of programs on the accompanying file archive that Graph-TI also used. The first TI graphing calculator websites started appearing in the Fall of 1994. Almost all of the early websites were individual programmer pages featuring the personal programs that that particular person had created for themselves, and were hosted on college networks. Colleges were actually the main forerunners in Internet expansion and adoption, as they had the necessary hardware and personnel resources to make using the Internet viable. It wasn't until the TI Graphing Calculator Magazine (TI-GCM) was started in Summer 1994 by cousins Brian Hill and David Smith, however, that the TI community we associate with today really found its own voice. The first issue of the TI-GCM was released in November/December of that same year, and it helped connect the online community, bringing together the latest news, events, and major program releases that were happening at that time. It should be noted that the TI-GCM newsletter was actually physically mailed to people, and required the payment of a nominal fee to cover postage. Around that same time, the TI community developed the first assembly shell, ZShell, for the TI-85. Although the TI graphing calculators provided built-in programming support in the form of TI-Basic, the language was rather restricted in its capabilities and speed, thus limiting the quality of programs. Subsequently, programmers wanted to use assembly, as it provided low-level access to the calculator and its hardware, and allowed the creation of much more powerful and feature-rich programs. There were several programmers — Dan Eble, David Boozer, Magnus Hagander, Rob Taylor, Mel Tsai, to name a few — working together to figure out the ROM code and internal structure of the memory, and it was through the documenting process that they stumbled upon the custom menu pointer loophole that was used to allow execution of assembly language. Although this was a rather arduous and lengthy process, it was hastened by the TI community working together in cooperation and sharing information and resources on the Calc-TI mailing list. The TI community was forced to come up with an alternate method of executing assembly on the TI-92, as the calculator used a different processor chip (the Motorola 68000) and Texas Instruments patched the loophole used on the TI-85. The method that Dan Eble and David Ellsworth came up with, and that was used by the first assembly shell Fargo, also used a memory backup like ZShell. After they discovered that sending an oversized memory backup to the calculator would cause the excess information to overflow into other areas of memory, they deduced the correct amount of overflowing and placed pointers at the specific locations to execute assembly. Assembly language support was achieved for the TI-82 in Summer of 1997 with the release of OShell-82 by Jason Todd. Just like with the TI-85, the TI-82 uses a buffer table that points to the next routine that will be called when a key is pressed. The pointer is intercepted by way of a dummy variable, which instead points to a location in RAM where assembly code is stored. Texas Instruments eventually caught on to the fact that the TI community interest in assembly programming was not going away, and they decided to provide built-in support for assembly programming. The first graphing calculator to receive native assembly support was the TI-83 released in August 1996, and it was made possible using hexadecimal code (hexcode) and executing the programs using the Send(9prgmNAME) format. TI also provided assembly programming documentation on their website, detailing the underlying ROM code and internal structures of the TI-83. Some of the Texas Instruments programmers responsible for writing the TI-83 ROM code — most notably, Pat Milheron — would also regularly provide assembly help and assistance on the Calc-TI mailing list. In addition, Pat Milheron also wrote two useful assembly programs, Zasmload and Squish, that squished the assembly hexcode to make the programs smaller. TI later provided actual built-in assembly commands — Asm(, AsmComp(, and AsmPrgm — with the release of the TI-86 in June 1997, and which subsequent graphing calculators also received. Rather ironically, although the TI-81 was the first TI graphing calculator to be released, programming and development for it was quite limited as it lacked the linkport needed to send and receive programs. It was not until almost twenty years later in 2010 that it was eventually hacked by Randy Compton to allow for assembly programming via a custom interrupt routine. -> English sites: TI-Chip, TI-Extreme, TI-HQ, TI-Vault, etc. -> Non-English sites: Ti-Fr, yAronet, TI-Bank, TI-Planet, etc. With the advent of assembly programming, there was new enthusiasm and exuberance around the TI community, and the community really took off in earnest. In fact, there was an explosion of community activity, with new programs constantly being released and websites popping up almost daily. Of course, this caused much uncertainty about where to find the latest versions of programs, and people struggled to stay up-to-date with everything that was happening in the TI community. There were a few notable sites, however, that attempted to stand out from the crowd and bring some order to the TI community. In particular, The Unofficial TI Calculator Home Page (UnPage) by Chris Dornfield, the Official ZShell Home Page by Henrik Edlund, the ZShell Fan Page by Magnus Hagander, and the TI Net Sites On-Line (TINSOL) by Amitai Schlair. On February 2, 1996, Isaac Salpeter contacted the webmasters of those sites, as well as other prominent figures in the TI community, asking what everyone thought about joining all of the content and resources on the respective sites into a single comprehensive site. All of them were very receptive to the idea, so Isaac Salpeter registered the domain name and set up the server, and a couple months later ticalc.org was opened to the public. In Spring of that same year, the first IRC channel for TI calculator discussion, #calc-ti on EFnet server, was started by "perki" and "Intel". IRC became an important communication medium for the TI community, as most of the notable sites and programming groups had their own channel that accompanied their site. For example, Dimension-TI had #dim-ti, TI-Files had #ti-files, and ticalc.org used #calc-ti. Although ticalc.org had become the face of the TI community and succeeded in uniting the TI community — consolidating the program archives, documentation, and newsgroups — it was still updated manually like every other TI community website, which caused there to be lulls in activity on the site. Unfortunately, Isaac Salpeter's college (Florida State University) decided to no longer host the site in January 1997, and ticalc.org subsequently went offline. The TI Graphing Calculator Magazine also began to be updated less frequently, as the most recent issue released was from November 1996. People then started writing both of them off as dead, and were eagerly searching for other TI sites online that had programs and content. Out of that collapse, TI-Files was proposed by Alex Highsmith in an email to Harper Maddox in the middle of March 1997. The original idea was to just publish a newsletter like TI-GCM, but that quickly progressed into a full-fledged website like ticalc.org. They also decided that the website focus would not merely be about program archives, documentation, and newsgroups, but about providing a true community experience with programming columns and articles, programs under development, a top ten list, high scores, a newsletter featuring a game of the month award, and so on. In addition, they also expanded upon the simple .zip file program listing that other TI sites (including ticalc.org) used, and provided each program with a detailed description, screenshot, and rating. They then assembled a team of people from around the TI community that had their own sites that covered different content, and combined their respective site contents under the TI-Files banner. The original TI-Files team consisted of nine people, with each person providing something separate from everyone else. For example, Dave Jaklitsch provided the program archives, while Bill Nagel provided the assembly columns. The TI-Files site debuted at the end of March 1997, quickly becoming popular and known as one of the top TI sites online. Subsequently, when ticalc.org came back online in April, TI-Files and ticalc.org (along with Dimension-TI which was opened in September 1997 by then TI-Files member Adam Berlinsky-Schine) began their competition to be the top TI site, which lasted until the eventual collapse of TI-Files and Dimension-TI in December 2000 and November 2006, respectively. The competition and rivalry kept all three sites constantly striving to provide a better experience for the TI community with more content, features, and services, which ironically united the community and actually helped to invigorate it. There was also much borrowing of content, features, and services, as somebody would upload a new program to one site, and then it would appear on the other sites in a matter of days. Similarly, ticalc.org expanded when it came back online, and incorporated much of the community focus and ideas that TI-Files had come up with in its absence. Dimension-TI, in particular, really took the TI community to its zenith with a whole assortment of new features and services, including site hosting for other TI community sites; a user-submitted news system with user-rated comments; customizable pages and content based on user preferences using Perl/CGI scripting and cookies; an online store where you could buy graphing calculators and related accessories; programming challenges where you could compete against other community members to win actual prizes; a headline grabber that pulled news from other TI community sites; user-services allowing members to provide others with assistance with their programs, such as bug reporting, creating graphics, or beta testing; and a TI community directory listing where members could post information about themselves. They also improved upon the program page format that TI-Files had created, and provided much more information about the program. In particular, they provided a link to the author's community page, a list of other programs by that author, the size of the program, the creation and last update dates, a user-voted rating, its rank in the top ten list for that month, the number of times the program had been downloaded, tracking of bugs for that program, email notification when the program was updated, and even allowing the community to comment on the program. Simply put, it was a true community experience. » Site: #ti-calc for ticalc, #ti-files for TI-Files, #dim-ti for Dim-TI, etc. » Groups: #tcpa for TCPA, #z80AC for Z80AC, #ACZ for ACZ, #basm for BASM, etc. -> competition between major sites: Ticalc.org vs. TI-Files, United-TI vs. MaxCoderz, etc. -> Hays Games Company, Darwin Mach, etc. -> TI releases different calculators for Europe, Asia, etc. There is almost no doubt that the TI community will continue onward into the foreseeable future as long as Texas Instruments continues supporting their graphing calculators. Due to aggressive marketing and collaboration and support from schools and teachers, the TI graphing calculators are the most popular series of graphing calculators on the market, far outselling HP, Casio, and Sharp. The question, therefore, is what will the future TI community look like. Unfortunately, the community of today and going forward is not as strong as it once was in the past. There used to be several active independent programmers and programming groups that were routinely releasing programs, but most of them have since stopped programming or just completely disappeared from the community altogether. Consequently, the amount of new programs being released and uploaded to ticalc.org has drastically decreased from its previous levels, although people are still visiting and downloading programs from ticalc.org at the same levels as before. The general community site activity has also greatly decreased, and is now just concentrated at a few locations — Omnimaga, Cemetech, CodeWalrus, TI-Basic Developer and TI-Planet — whereas before there were several active sites that you could visit in the community. 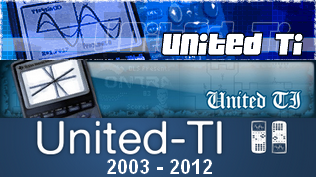 Even United-TI (UTI), which has been one of the main hubs of community activity since 2003, closed down in 2012 due to dwindling activity and membership; Christopher Mitchell of Cemetech stepped in and merged a read-only copy of the UTI forum contents into Cemetech for community posterity. Also, since code repositories and social networks have become mainstream in 2008, many new TI users have switched almost exclusively to Github, Reddit and Youtube to showcase their calculator work or ask for help, abandoning forums, IRC channels and sometimes even ticalc.org file archives in the process. As a result, calculator programming have become less and less centralized on calculator-related websites and many community websites decided to adapt by adding non-calculator-related sections to their respective forums (such as computer, mobile and web development, as well as gaming and pixel art), as an effort to keep their older members even after they leave high school. Personal blogs also regained some popularity, like in the late 90's and early 2000's, leading some members to post their creations and discoveries there instead of forums, at the cost of visibility. The web forum format across the entire web, not just the TI community, also decreased in popularity with people switching to Facebook groups and Reddit. The reality is that most of the people that have been involved with the community in the past have since moved on to other things, such as a job, college, relationship, or family. This is actually the typical pattern that most community members follow, as the average community member is involved in the community while they are in high school, which means they have anywhere from 2-5 years of community activity before they disappear, and many of the younger, less dedicated members will often leave about 6 months after joining. Besides the competition from real-world responsibilities, there is also fierce competition from other technologies. In particular, things like iPhones, iPods, facebook, and so on have all eaten away at the possible community membership. In the past there was not a lot of real competition from those sources, as those technologies only gained widespread availability in the last few years, so those people that were more technically-inclined would spend their time in class programming the graphing calculators, which would subsequently cause them to get involved in the community. To see how activity in the TI community evolved since 2002, check out the TI Forum Posting Statistics page.